The question of a “fair” allocation of TTC revenues between the farebox and subsidies comes up quite regularly, often at budget time, but now also in the election campaign. Some argue that the riders don’t pay enough, while others argue that they pay too much. Rarely does anyone look at the detailed figures. There are three sets of figures: data for the current 5-week period (this interval is used to avoid variations due to lengths of months), year-to-date data, and full-year data. These are further subdivided by actual and budget values. On the income side, the total 2010 revenue is projected at $957.515-million against expenses of $1,412.034-million. 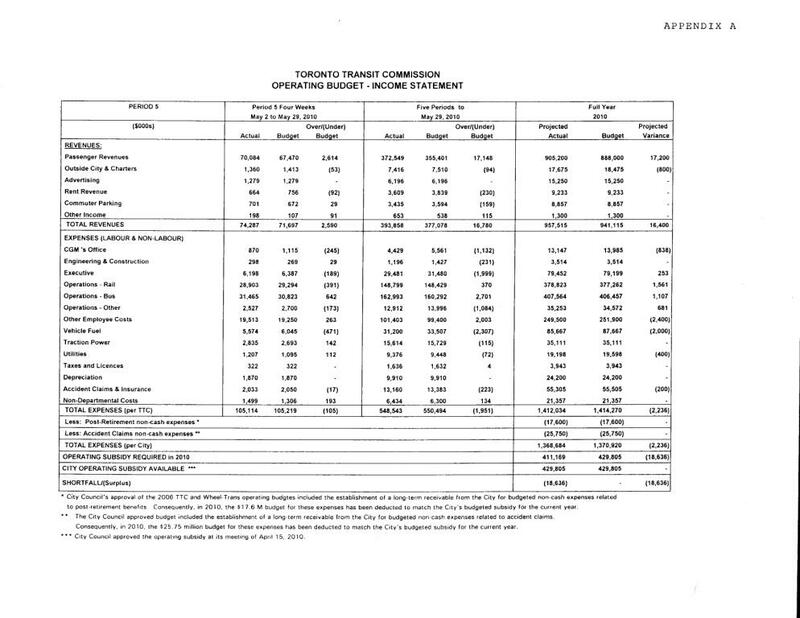 However, within the revenue, only $905.200m comes from the farebox, while $52.315m comes from other sources. Charters and services operated under contract for transit systems in the 905 are on at least a break-even basis. Although the expense of running them appears as part of the system’s total, this expense is completely offset by revenue (projected at $17.675m for 2010). On the expense side, the total cost for subsidy purposes is reduced by two deferred items: post-retirement expenses and accident claims. These do not require cash outlays in the current year because they not be paid until future years. This gets us to a net cost for operations of $1,368.684m and a projected shortfall of $411.169m. The City has actually budgeted for a shortfall of $429.805m, but the TTC’s ridership and fare revenue held up better than expected in 2010, and the City’s full subsidy provision will not be required. Any leftovers remain under the City’s control for year-end budgetary adjustments.